Please note that driving into central Oxford is currently very difficult because of major roadworks. Hythe Bridge Street is closed causing major congestion all the way from St Giles to the Botley Road. Parking in central Oxford has always been limited and expensive and the demolition of the main multi-storey Westgate carpark has exacerbated this. Up to date travel information for Oxford can be found here https://www.oxfordshire.gov.uk/cms/public-site/live-travel-information. We have been advised that visitors should add up to one hour to the estimated journey time to Oxford suggested by online route planners or GPS devices. Pembroke College is located on Pembroke Square just off St Aldates in central Oxford. Gloucester Green coach station and Oxford rail station are each a 10 – 15 minute walk from Pembroke College. There are also five park and ride facilities http://www.parkandride.net/oxford/html/oxford_parkandride.html but we strongly recommend avoiding the Seacourt park and ride West of Oxford as travel in is affected by the congestion. If you need to travel by road the least congested approach to Pembroke College is from the south of Oxford entering the city by the A4144 or Abingdon Road. After crossing the river all traffic (except buses) veers left (A420 or Thames Street). Take the first permitted right turn and then immediately turn right into Speedwell Street. At the T junction turn left into St Aldates. 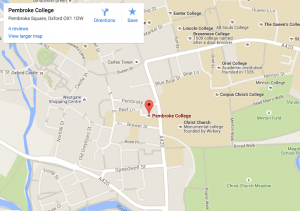 Pembroke College is then on your left opposite Christ Church College. (Do not then continue right into High Street which is closed except for taxis and buses).